With the integration of SCOM and SCSM we can leverage our DA (Distributed Applications) created in SCOM into SCSM. Which is great but how can you extend the properties of a Business Service? When you first start with this synchronization the first part you get stuck would be how to setup the connection which is a different topic. This post will describe what to do when you have your Services in SCSM and want to add custom properties to these services. 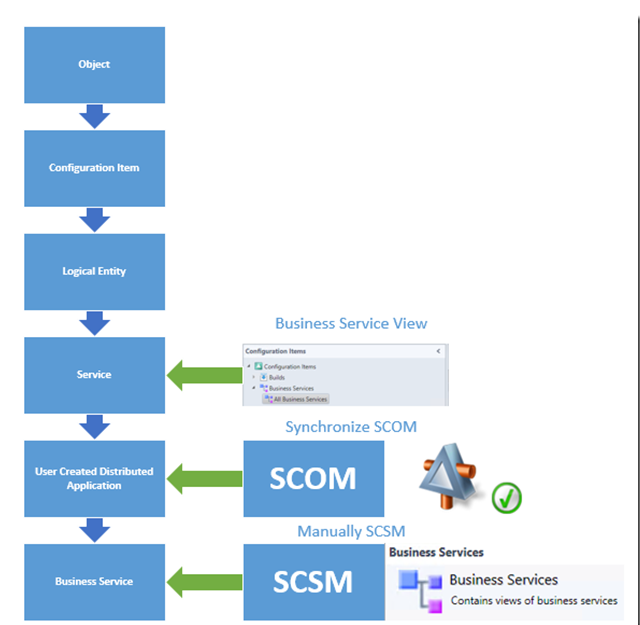 Understanding the “Business Service” in SCSM When you look at the business services in SCSM it all looks really simple, right? 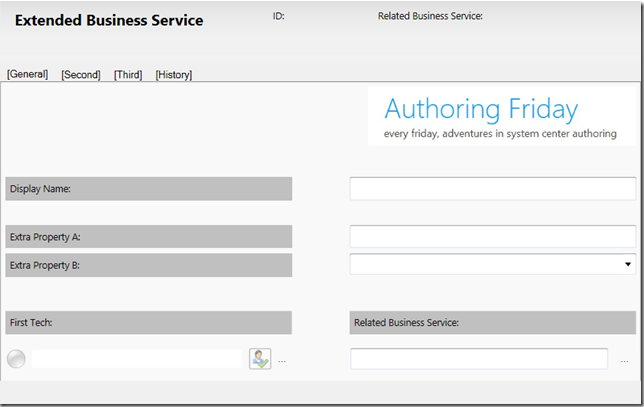 You can either create the Business Service Manually from within SCSM or synchronize them form SCOM. It is the same, right? To answer this question you need to open up the MP’s and put on your XML gear and dive in! This is the structure let’s take a look at SCSM and synchronize a Distributed Application from SCOM to SCSM. After checking the DA was synchronized now create a second “Business Service by clicking the Task “create Service”. When you review the Business Service View from the SCSM console you see 2 “Business Services”. This all looks really transparent, right? Or maybe there something more to it? Yes up until now this is what a user would experience. To the user this is all transparent and he will see 2 business services. This is perfectly correct since to the user a business service is a business service. From our world as authoring freaks there is far more to it. The view in SCSM is target at System.Service which makes it possible to show both child classes beneath the System.Service Class. This gives the console user the experience of looking at one “Business Service”. While in reality he is looking at multiple classes. 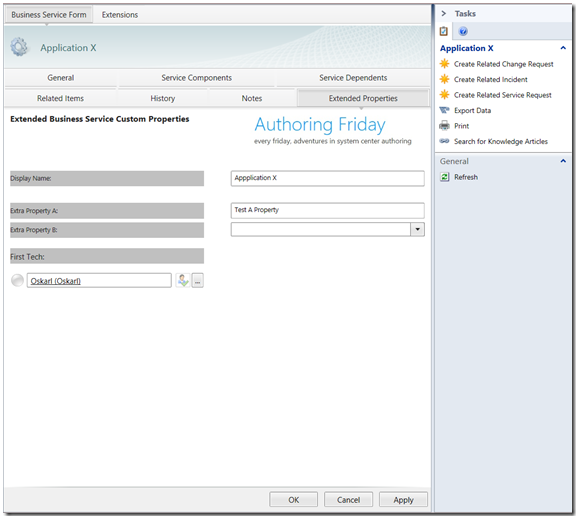 A manually created Business Service in SCSM (Created by the task “Create Service”) will live as a business service in SCSM. Now why did they create a new class Business Service Class? Why didn’t they re-used the already existing class and extended this one? The answer to both these questions lies a little deeper and to understand you need to really examine the classes and their properties. 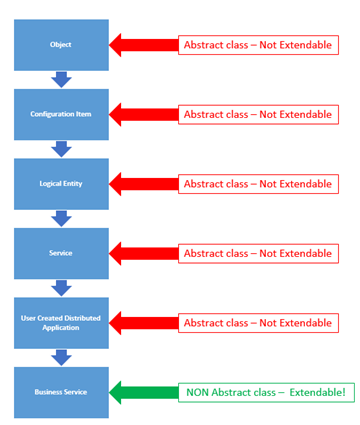 First remember an abstract class is not extendable nor can you add an abstract class instance manually in SCSM! Now you understand why they needed to create the extra class. All other classes are abstract and therefore you cannot create an instance of this class from SCSM by using the task “Create Service” nor can you extend them. So basically you cannot extend the Distributed applications which are synchronized from SCOM! This is a fact which we cannot change but there are solutions to work around this problem. 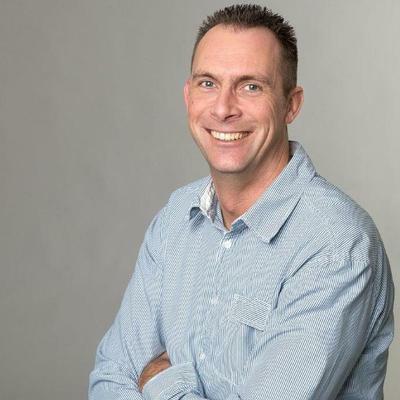 I will describe the solution to “Extend” the Synchronized DA’s from SCOM! Since we cannot really extend the abstract class we are going to create a solution which is based on a new class and a type projection. The end goal is again a transparent solution to the user looking at the business services. Make Sure the relationship “ExtendedBusinessRelatesToService” has a Source Max Cardinality of 1. This is required to be able to use this relationship in a later phase. You have now created a Management pack with a new class and properties. Next we are going to edit the default Service Form. After creating this form in your management pack, save the management pack and close the authoring console. Now we are going to extend the Type projection target at the customized service form by using a XML editor. We are going to change this type projection to include our new class, After changing the Type Projection we can use the authoring tool to add the bindings. Now save the XML and open the authoring console again. 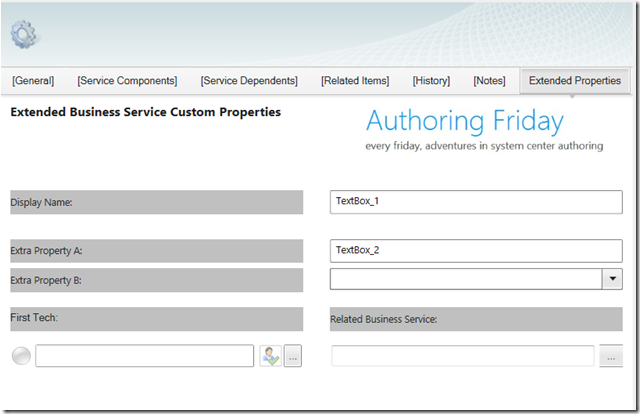 Notice how you can now traverse the relationship “ExtendedBusinessRelatesToService” to select properties of our custom class. Select the correct binding paths for all fields. The path to the TECH 1 user you need to add this manually and can’t use the browse function wen using this binding path. This is because this relationship is three layers deep. Just add the binding path like “ExBusinessServiceRelatesToService.Tech1RelatesToExBusinessService”. 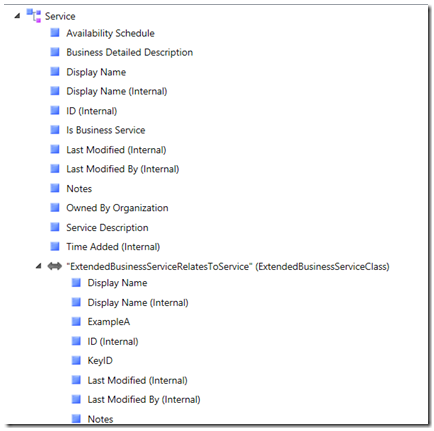 This binding path now travels over the first relationship from Service To Extended Service (ExBusinessServiceRelatesToService) and two the second realtionship Extended Service clas to User (Tech1RelatesToExBusinessService). After this you can save the management pack and seal it. Create a view for your new Class. Create a Class and relate it to an existing business service. 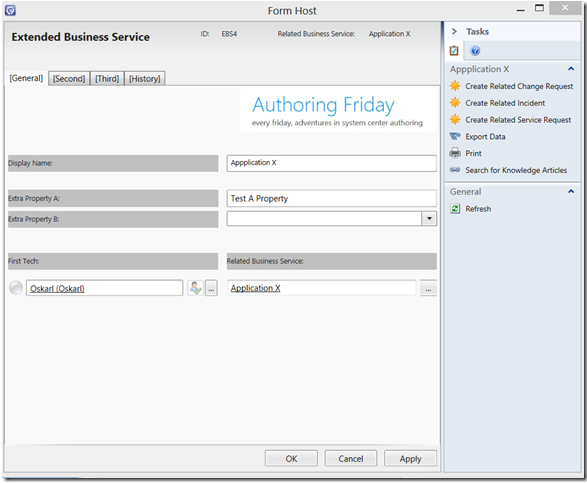 This post describes how to “extend” a business Service in SCSM. The idea behind it is you grant your CMDB manager rights on the Extended Service View and instruct him how to create this class and link it to an business service. The other users using the console don’ have access to this view and this solution will be transparent to them. They experience simple editing and adding of custom properties to business services. If you want this even fancier you could create a task to add the custom class and link them to a business service or use orchestrator to automatically create these for you !